by Hieromonk Isaac Hardcover 719 pgs. 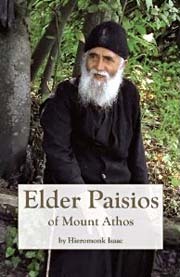 Elder Paisios of Mount Athos (1994) is perhaps the greatest and most revered Elder of the Orthodox Church of our time. Even though he lived the monastic life in obscurity on the Holy Mountain of Athos in northern Greece, he became a shining light for thousands of faithful who flocked to see him. His life, miracles, and teachings continue to touch the hearts of people throughout the world to this day. Unquestionably, this present biography (written by his spiritual disciple Elder Isaac), which is the most authoritative account of his life, will inspire readers forevermore.